In this tutorial, we are building an interesting application using Arduino and PIR Sensor. A Burglar Alarm – is basically an intruder alarm or an anti theft alarm. So this project is all about building an anti theft alarm or an intruder alarm using Arduino and PIR sensor. It is possible to enhance this project with many features like adding a GSM module to send SMS alerts to specified mobile numbers when an intruder is detected (when a motion is detected inside the range of PIR sensor). So lets get to building our burglar alarm project using arduino. Lets first build a simple diy burglar alarm using Arduino, PIR sensor and a buzzer only. If you are a beginner, you need to read the following tutorials to build this circuit perfectly. 1. Â What is Arduino – read this article if you are very new to Arduino. 2. Blink LED with Arduino – say Hello World! Â – Learn how to blink leds using Arduino! 3. Simple LED Projects using Arduino – Â Get your hands in it! Do some LED projects using Arduino to get the basics! 4.Â Interface PIR Sensor to Arduino – Learn about how a PIR sensor works and how it is interfaced to Arduino. Go through above tutorials before you try building this burglar alarm system using arduino! So lets begin our project. 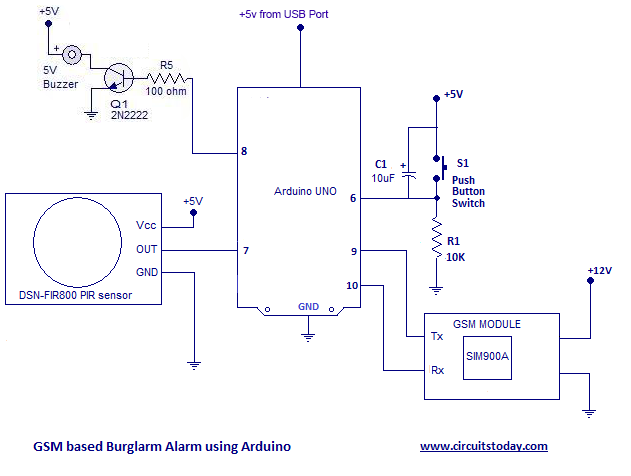 The circuit diagram to build a simple burglar alarm or an intruder alarm using arduino is given below. You may assemble the circuit as shown in the diagram. Before getting into working of the alarm circuit, I shall brief the components used in this project. 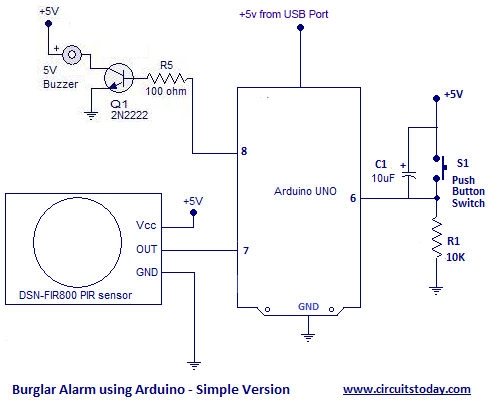 PIR Sensor – is the heart of this simple burglar alarm circuit using arduino. A PIR sensor – is basically a motion sensor or a motion detector which identifies any object that moves inside its range of view. PIR sensor identifies infra red radiations emitted by any object under its radar range. Buzzer – is used to create a sound alarm when ever a movement is identified inside the range of PIR sensor. A transistor 2N2222 is used to drive the buzzer. The maximum current that can be sourced or sinked from an arduino pin is 20mA (the total current being 200mA from different pins). But the buzzer will need more than just 20mA for its proper functioning. So how to give the necessary current required fir buzzer ? We use switching transistor 2N222 for this purpose. It can act as a switch and at the same time it provides the required current amplification. A 2N2222 transistor with a gain of 100 can give upto 1A current at its output. Another purpose of using a transistor in between arduino pin and buzzer is isolation. A short circuit of the buzzer will destroy only the collector – emitter junction of transistor. Since their is isolation at the base region of transistor (base is connected to arduino), the destruction of collector-emitter junction will not affect base and hence our arduino will be safe from getting burned!Â The 100 ohms resistor at base is used to limit base current of transistor. Switch – a push button switch is used to reset the burglar alarm once its activated. The capacitor is used for bypassing bouncing effects of a switch ( debouncing capacitor). Note:- Wire all grounds together at a common point. So we have finished our simple diy arduino burglar alarm. How easy was that? Try installing this diy intruder alarm in your garden area and see its practical application. Since we have built a simple arduino anti theft alarm, why not build an advanced version of the same burglar detector? What if we can build a burglar alarm that texts you an sms when an intruder is detected ? cool idea – isn’t it? So lets get our hands at it – a burglar alarm that sends text message (sms) using arduino and pir sensor. We are going to use a gsm module in addition to components and modules used in above circuit. You need to have an idea of how to interface a gsm module and arduino together before you begin this project. Assemble the circuit as shown in the gsm burglar alarm circuit. GSM/GPRS Module – Buyers Guide – you don’t own a GSM/GPRS module? are you looking to buy one? Please go through our detailed buyers guide for GSM/GPRS module which helps you to choose the right module in the right price range. Refer previous circuit diagram and its explanation first. The only addition module used is GSM Module. So how simple was that advanced arduino intrusion alarm using GSM module ? The program is self explanatory! If you have any doubts, please ask in comments section. I want built a burglar alarm that can send sms and call by using pir sensor,sim800l and arduino uno . is there anyone to help me? Circuit not working please. I tried connecting as explained but the buzzer won’t come on. PIR not detecting motion I guess. Switch key having no effect on the circuit. I cannot get the text messages sent to my phone. Not sure where the problem might be. My GSM shield shows connection is made, the sensor notes movement, the output is triggered, but no SMS. Please give me some suggestion sir. Thanks for the awesome project it was much easier to understand with your comments on every line of code. Can you help me out in bringing a little change in same project, What I want is a user can enter/change his mobile number by simply sending a SMS to the SIM in gsm module. Buzzer immediately turns on when I power the arduino board and remains on all through… What I’m I missing? This is really a very nice project. But I am facing a problem. The gsm modem is not sending any sms after working perfectly twice. Thougb I have not changed the code or anything. Kindly help me to fix the problem. Unfortunately my buzzer immediately turn on after powering my arduino board and stays ON. Though the buzzer sound becomes louder after the Pir goes HIGH. I have tried to verify the circuit connections again and its still the same thing. What I’m I missing? And suppose i install this protype on more than one place, then how one knows the message is from that specific location? If any body tempered the PIR sensor and/or the connections(connection wires) before theft, then what will be the response of this prototype?? i am using sim900 with arduino uno and i want to interface a radar sensor hb100 to read the speed values and send through gsm but whole process should be done without manual interference means after damping code the circuit should work with out system and should work with a battery .so plz someone suggest me the code to implement this. Could you please direct me to where buy these modules ? 3. can you hi-light in the Arduino code where the parts I can edit with my own details ? txt msg words etc ? sir, pin 9 and 10 of arduino are different while i think the RX and TX of gsm module should be connected with RX TX of arduino that is pin 0 and 1. PLZ help me I can’t complet my project becouse when i join all the item acording to the circuit digram but when I add my SIM800 gsm module the buzzer always goes on with out any reason and sms alart goes on my cellphone without any reason.What should i do. What type of Arduino ? Is it ATMEGA328 ? Best GSM module guidance sketch with details explained. I am developing laser security alarm with PIR sensor as well. Succeeded in testing it. Thanks a lot. Your free guidance will be used by all in a long way to go. Thanks a lot Sir/Madam. sir which software we require while dumping program? im using sim 800l gsm pls give me a code of this. I cannot get the text messages sent to my phone. Not sure where the problem might be. My GSM shield shows connection is made, the sensor notes movement, the output is triggered, but no SMS. Any suggestions? Thanks for any ideas. Hello sir, is there a need of load in gsm module to send an sms ? @Sherylle – Wire the circuit as shown in diagram. Make sure your code is correct. It is obvious. U have to include GSM Module. can you show the full code to produce ring? I have connected according to your instruction. But it is sending SMS continuously. The push button is not stopping the buzzer or gsm module. Can you please help me? The following statement has a bad error. Sir I’m making this project but my GSM Module is not connected to network,, how to resolve this problem?? kindly guide me please… I’m using SIM900A Module. In the GSM based Arduino Intruder Alarm â€“ Circuit Diagram there are 2 different voltage source 5v and 12 v. Can i make the PIR, Arduino UNO, Switch and Buzzer in parallel connection to the 5volts same source (what type of battery). And for the GSM module what type of battery and ampere rating? I would like to make an alarm for my motorcycle. i hope i can put the whole module inside the toolbox of the motorcycle. i’m having trouble with the program on how to deactivate the buzzer if i replied to the sms send to my phone…. thanks your sir. @Mouli – You are supposed to use a Push Button Switch. A push button switch generates a High pulse only for the time the switch is kept pressed. Once you release the switch, the switch will go open and the pulse from switch will be back to LOW. I think, you are mentioning about a “Push to ON” switch. The program is written for the push button switch (just like the reset switch of 8051). good day everyone!!. i am currently working on a project with arduino uno using pir sensor and push button. this is how the module should work, first , pir sensor will detect presence of human and light up the led( i substitute the buzzer with led), after a moment if the button is pushed, the led will turn off and waiting for the input form pir sensor again . it seem does work as i expected. really need your help as i am very new with arduino.. here the code. In the GSM module there will be one SIM and in the subroutine ( send Text Message)there are two mobile numbers used, Is that first one the SIM card Number of the GSM Module and the second one the Mobile number where the SMS has to be send!!!! @Yogaraja – They are two different mobile numbers and SMS will be sent to both of these numbers. It is not the number of SIM card inside GSM module. Hope you understood! @Yogaraja – I have edited the code! Now its code to send SMS to one mobile number only.